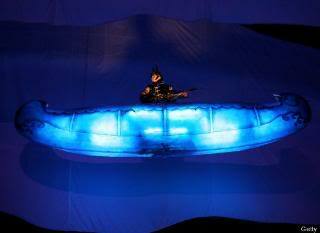 flying blue canoe with a fiddler competing with his shadow on the moon. 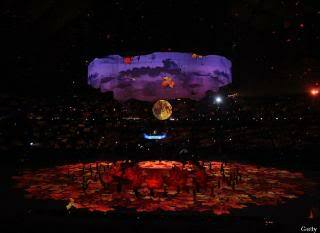 This tribute to the fiddling traditions of Canada, particularly those of the maritime provinces, began with the appearance of the devil in a flying canoe, a reference to the story of the Chasse-galerie. As the canoe descended from the ceiling, the opening of the song 'The Old Ways' was performed by Loreena McKennitt. 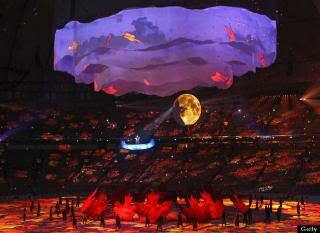 This portion of the ceremonies was concluded by Ashley MacIsaac who performed his song "Devil in the Kitchen". There are various versions of this tale - here are two. Long ago, there were a number of lonely lumberjacks working in the center of a very large forest. They cut down mammoth trees and watched them crash into the thick snow in exactly the place where they said the trees would land. They would cut up the trees and haul them hither and thither. They worked hard, Mon Dieu, very hard indeed! But they were lonely for the women they had left behind. On New Years Day, it snowed so hard no work could be done. The men huddled in their camp and spoke longingly of their home. They passed around the rum and drank toasts to the New Year, but finally Baptiste said what they were all thinking: "I wish to go home today and see my girl!" There were murmurs of agreement, but Jean replied: "How can we go home today? There is more than two meters of snow on the road, and more snow is falling." "Who said we were walking out of here?" asked Baptiste. "I am going to paddle out in my canoe." Now the men all knew that Baptiste had a canoe with paddles out back of the camp. Baptiste had made a pact with the devil. If the devil would make the canoe fly wherever Baptiste wished, the lumberjack would not say Mass for an entire year. However, if Baptiste did not return the canoe before dawn of the day after he used it, the devil could keep his soul. While Baptiste and his companions were in la chasse-gallerie, they could not say the name of God or fly over a church or touch any crosses, or the canoe would crash. Many of the men refused to participate in Baptiste's New Years scheme, but he managed to find seven companions to fly with him in the canoe back to their home town to visit their women. Baptiste and his friends got into the canoe, and Baptiste said the magic words: "Acabris! Acabras! Acabram!" When Baptiste was done binding himself to the devil, the canoe rose into the air and the men began to paddle their way through the sky to their home. Their womenfolk were so glad to see them! They celebrated long into the night, drinking and dancing. It was close to dawn when the men realized they had to return the canoe to the lumber camp by dawn or forfeit their souls. They searched for Baptiste, and found him as drunk as a lord, lying under a table at the inn. They bundled him into the canoe, spoke the magic words, and paddled away. Knowing that Baptiste would start swearing if they woke him, one of the men tied him up and gagged him so he would not speak the name of God at an inopportune moment and crash the canoe. When Baptiste awoke, he sat up, struggling with the ropes that bound him. He managed to loosen the gag, and shouted: "Mon Dieu, why have you tied me up?" At the name of God, the canoe took a nose-dive, plunging towards the ground. It hit the top of a large pine tree and all the men tumbled out and fell down, down into the darkness just before dawn. They were never seen again! Beside a beautiful lake not far from the sea, there lived three brothers. They were young rivals, each trying to do everything better than the others. Sometimes they were visited by an old woman. She was nearly blind so crippled that she could hardly walk, and always hungry. But when she had eaten some food, she could do wonderful things, and she could give remarkable power to a person she liked. Joseph, the youngest of the three young men, treated her very well. Whenever he gave her food, she was grateful. One day after he had fed her, she said to him, "Take your axe and make some moccasins for yourself--some wooden ones. In them you will be able to run as fast as a bird." And so Joseph made for himself a pair of wooden moccasins. When he wore them, he could run very fast. In fact, he could run faster than the swiftest animals. He caught game animals and brought home much meat. His two brothers were jealous because the youngest was a more skillful hunter. They wondered what he had been doing, and they watched him continually. One day they saw him open his birch-bark box and take out his wooden moccasins. Then he disappeared. The brothers had already noticed certain curious chips where Joseph had been working. So they were very glad when they saw what he took from his box. They gathered together all the wood chips and made moccasins for themselves. In their wooden moccasins they could run even faster than Joseph. Then Joseph knew that they had learned his secret. The next time the old woman came for food, he fed her as usual. This time she said, as she thanked him, "Make for yourself a dugout canoe. Then you shall soar across the water like a bird." So Joseph made a dugout canoe. Using it on the lake, he caught big fish and many birds. Again his brothers were jealous, and again they watched him in all that he did. Finding some chips after he had made his boat, the two older brothers gathered them and built a canoe for themselves. Working together, they made it better than Joseph's. It was a wonderful canoe. In it they went out to sea and speared many whales. This time Joseph was angry. He called the old woman and fed her well, giving her more food than ever before. "Now you will make another canoe," she said when she had eaten. "This one will fly in the air. You will really fly like a bird." And so Joseph made another dugout. When he had finished making it, he carefully picked up all the chips and burned them. 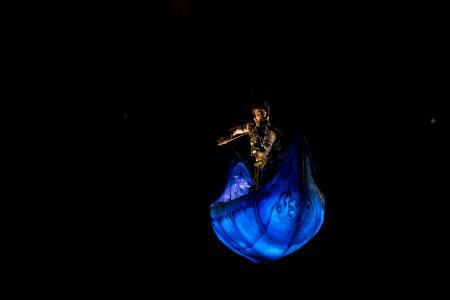 Then he took leave of his brothers and sailed off in the air. A special thanks to all of those on the North Woods teams -- on both side of the border -- these projects were exciting to do and we had a great time -- -- GOOD WORK -- thanks for going the extra bit for quality, service and timing -- "we got er dun !"